As a college student living on a budget, discounts of any kind are appreciated, and readily taken advantage of: Sonic Happy Hour, Applebee’s half price Appetizers, student discounts on movie ticket, just to name a few. As this list indicates, the best kind of discount is one that can be applied to food. 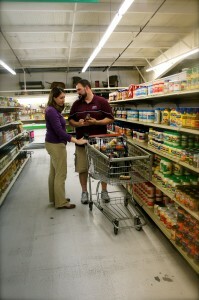 Recently, I have uncovered a hot spot of food discounts: Meridian Grocery. Named for its location on South Meridian Street, Meridian Grocery is Newton’s best-kept food secret. Brent Brockmueller, Hesston College admissions counselor, is a big fan of Meridian Grocery. He and his wife Angie shop there quite often. Not only can you find Harry Potter on Blu-Ray and 11 different kinds of Cheerios Meridian Grocery has a lot to offer college students, too, especially if they’re looking for some great deals on food. Meridian Grocery carries cereals ranging from Honey Bunches of Oats to Fruit Loops and Raisin Bran; with each box being at least a dollar cheaper than you would spend on the same box at Wal-Mart. You can find a wide variety of granola bars, depending on the week, also at a discount of about a dollar.For the coffee drinker, a good variety of brands frequent the shelf, including discounted Keurig cups. And Meridian Grocery has more to offer than just the typical dorm room food. Meridian Grocery sells fresh-baked goods, such as rolls and bread, and also fresh produce, meat, and cheese-all from local producers. And there’s more. A spray bottle of Febreeze can be found for $3.99 and enough laundry detergent for 50 loads of laundry can be purchased for $4.45. The Brockmuellers’ favorite thing to buy at Meridian Grocery is movie candy. Brent and Angie often stop and pick up some discounted Sour Patch Kids on their way to the movie theater. The next time you think you need to go to Wal-Mart to pick up some groceries, consider stopping by Meridian Grocery on your way and see what “treasures” you can find. Meridian Grocery is open Monday through Saturday from 8 a.m. until 7 p.m. and is located at 101 S. Meridian in Newton.